Improve employee comfort while increasing productivity. Use at loading docks, garages, and food processing facilities. Keeps birds, flies, moths, mosquitoes, wasps and other insects out while providing fresh air ventilation, sunlight and increase security. 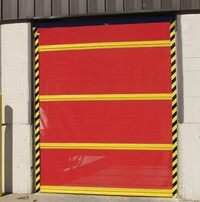 Constructed of durable, all weather vinyl coated polyester that is fire retardant as well as mildew and UV resistant. Easy to install. 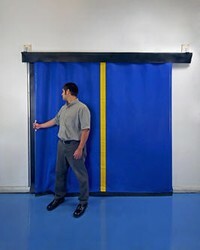 Screen can be attached to the top of the doorway opening, or mounted to the inside wall. Each method uses a simple manual roller & track system that allows the screen to slide smoothly from side to side (Pic. 1), or roll up and down (Pic. 2). ZORIN will contact you prior to processing the order to verify color. If you have any questions please call ZORIN @ (888) 378-6525.